The research paper "Extinction Risk from Climate Change" published in the journal Nature in January 2004 created front-page headlines around the world. The notion that climate change could drive more than a million species to extinction captured both the popular imagination and the attention of policy-makers, and provoked an unprecedented round of scientific critique. Saving a Million Species reconsiders the central question of that paper: How many species may perish as a result of climate change and associated threats? Leaders from a range of disciplines synthesize the literature, refine the original estimates, and elaborate the conservation and policy implications. considers the conservation and policy implications of the estimates. Saving a Million Species offers a clear explanation of the science behind the headline-grabbing estimates for conservationists, researchers, teachers, students, and policy-makers. It is a critical resource for helping those working to conserve biodiversity take on the rapidly advancing and evolving global stressor of climate change-the most important issue in conservation biology today, and the one for which we are least prepared. "This book translates the messages conveyed by past, present, and expected extinctions from climate change into loud and clear science-based actions required to conserve biodiversity." "The book...provides elegant, vivid and in-depth reviews of the issues." "This book is a tour de force overall and an excellent summary of the issues relating to extinction risk from climate change. ... The book's greatest strength comes from its collection of ideas, perspectives, and reviews on this complex topic, resulting in the whole being much greater than the sum of its parts. Saving a Million Species provides a single reading source for anyone who wants to quickly get up to speed regarding the risks that changes in climate pose for species extinction. ... Edited volumes this useful are few and far between. 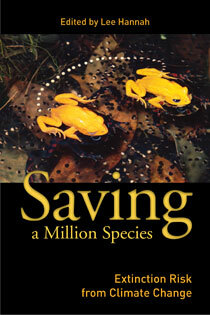 I recommend Saving a Million Species to anyone interested in the conservation of biological diversity." "The volume also provides a solid overview of both past and current extinctions for insights into what we might apply to current climate change." "This book highlights a very important issue of global concern and anybody who can read it should do so. Ultimately, it aims to stimulate discussion and directed research..., although research should not be a substitute for action.... The book presents evidence from both the aquatic and terrestrial realms that it is no longer a question of whether or not we are in the midst of a mass extinction event, we are, the question now is, what can we do about it?" "This is a very readable book on an intriguing subject: climate change and species extinction processes." "The possibility of a calamitous loss of biological diversity arising from synergism of human actions and climate change looms larger at every evaluation. Lee Hannah and colleagues have done a brilliant job of assembling and presenting the critical information on this central issue. The resultant book provides a rich and timely briefing for breadth and depth of this topic." "Saving a Million Species provides a much-needed review of extinction risk from climate change, penned by the best experts in the field. The early extinction-risk numbers associated with climate change were big and worrisome but didn't include marine or freshwater environments. This book addresses those neglected systems and argues that action is needed now to prevent further losses. Extinction risk is the most critical area of research in climate change biology."